Jim and Kim Musselman and Captain/First Mate Jason Swan are DNR licensed and certified US Coast Guard Merchant marine officers for vessels up to 100 gross tons. Jim and Kim are both Ferris State University graduates. Kim earned her degree in Court and Conference Reporting and Jim in Marketing and Small Business management. Kim was a court reporter for 12 years before leaving the work force to start a family. Jim went on to establish Great Lakes Plumbing, Heating & AC in Indian River and Petoskey, where he was the owner/president for 32 years. 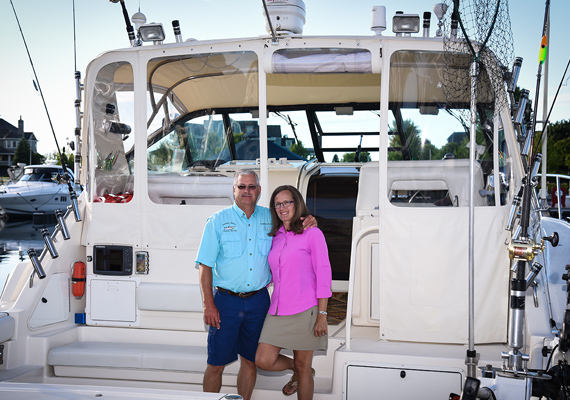 After selling their business in 2016, Jim and Kim now fish full time in Michigan during the summers and Key West, Florida, in the winters. First Mate Jason Swan serves as first mate whenever he can. He is also a licensed captain with many years of experience. He is employed by the Michigan DNR Fish and Wildlife Service Fisheries Division.